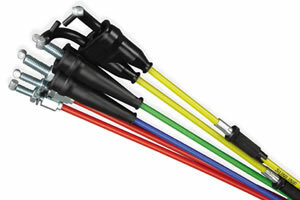 Control Cables designed specifically for Off-Road, Motocross and Supercross racing. These cables incorporate the latest advancements in cable technology. The clutch cables utilize coil-wound housings for precise clutch control, while the throttle cables use 1.5mm (7x7) wire for strength and durability. Both throttle and clutch cable housings are Teflon lined with larger diameter housings to reduce inner wire drag. Due to the wide varieties of cables, please email the make, model, and year of your bike to get the correct part number and price.